Why Pilates from Head to Toe? This spring I thought it would be fun to do a simple challenge with one exercise to complement your weekly or bi-weekly Pilates class and to throw into your home workout. For those who do not workout at home yet here's the perfect opportunity to try to do a little something: the Pilates Plank Challenge! The plank position is inherently challenging, executed properly the whole body is engaged in maintaining it. 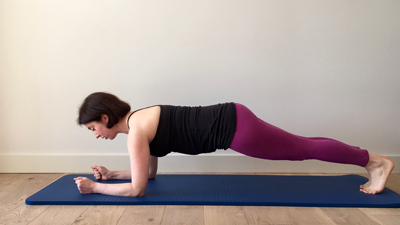 It is the foundation for many advanced Pilates exercises on the mat and the equipment, so improving your plank will help improve and advance your Pilates practice. It doesn't take a lot of time, equipment or special attire to do so you can easily fit it in at some moment in your day. How do I do a Pilates Plank? Correctly maintaining the position works the whole body. If you can do your plank with a mirror nearby to start, that could be helpful! Your elbows are straight but, not locked or hyper extended, this is extremely important for building arm strength and not stressing your ligaments! The backs of the legs are active and lifting upward energetically. 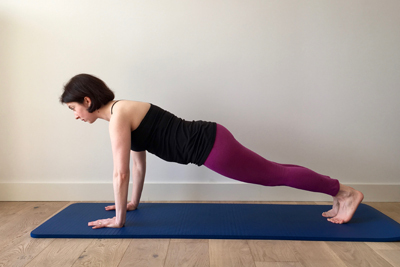 Doing the Pilates plank means concentrating on your breath and your abdominal engagement. Inhale into your whole rib cage and exhale to draw your belly in without changing your plank. When you feel the position getting harder continue to focus on your breath. Keep the position dynamic and the whole body will work, start sinking somewhere and the rest of the body will slowly sink. Observe, without judging, which area feels stronger, which area needs to work harder. Feel free to take notes each day after holding your plank to log progress. To start, find the position you can hold and the duration that is suited for your working level today. The goal is to progress but start where you are comfortable and not where you are struggling. 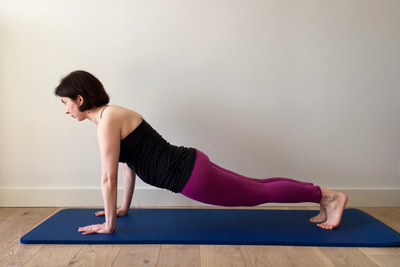 If you have shoulder, elbow or lower back issues that you are worried about you can start with the modified plank on elbows and forearms, see photo. It isn't necessarily easier, it simply protects the areas just mentioned in case of existing injury, strain or weakness. Listening to your body and respecting your working level are essential to improving awareness and progressing healthily in Pilates. Start by timing yourself holding the plank and see how long you can hold it for comfortably, start your Challenge there. Do your plank for 3 days at your established start duration. Ramp up for 5-10 seconds for the next 3 days. Continue in this manner for a total of 30 days. If doing the modified version on the forearms, start on the forearms not on the hands. 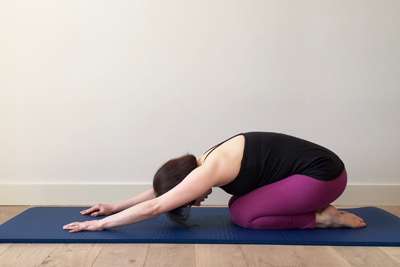 To finish, lower one knee down, then the other, push back into the child's pose and stay for a few breaths. Take a few notes, then continue your day! Have a great Challenge, I look forward to reading your feedback!